What years where the ZPA series amplifiers produced? How and why would I modify my ZPA series amp to make more power into 2 ohms bridged? Realistically the ZPA 0.5 will do about 1200 watts into a 4 or 1 ohm bridged load. At 2 ohms bridged there is a little catch. 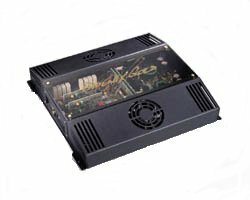 You have to understand that the amp's power supply switches between two modes, High Current and High Voltage. That's how it does equal power at 1 or 4 ohm bridged. There is two extra LEDs on the ZPA series which indicate which mode the amp is in: Green is High Voltage, and Yellow is High Current. In most cases of a 2 ohm bridged load this is what happens. When you are at lower listening levels the amp will stay in High Voltage, (the green led on center circuit board will be lit). But once you start increasing volume the amp will switch in High Current Mode (yellow led will be lit) and your power will be slightly reduced (ie 900 watts ballpark figure). It will try to limit the amount of power the amp can do to remain more stable into lower loads such as 1 ohm bridged. So at 2 ohms bridged when the amp won't provide as much power as 4 ohm bridged. Once the amplifier has switched into High Current mode it will remain in that mode until the system is turned off. So how do we get max power at 2 ohms bridged? Disable the switching power supply to stay in High Voltage, this is easily done by snipping two diodes underneath the far left IC chip on the vertical board that has the Power LED's on it. It will stay in High Voltage and produce some impressive amounts of power into 2 ohm bridged. I highly suggest you contact Phoenix Gold Technical Support and get the schematic that shows you the exact diodes to cut, if you are thinking of doing this. Of course keep in mind you must have 8 volts of pre-amps input, and a VERY STOUT electrical system to feed this amp the current it needs. A MODIFYING AND RUNNING A ZPA SERIES AMP AT 1 OHM BRIDGED IS NOT RECOMMEND, THIS WILL DAMAGE THE AMPLIFIER. What do I need to optimally run a ZPA amplifier in my audio system? Any ZPA amplifier must have at least 8 volts of signal input voltage. That means you MUST have a Tba transmitter (Tbat) or Professional Line Driver (PLD). If you don't have 8 volts of signal input the amplifier will never reach its maximum output levels. In addition, your car's electrical system must be very strong to handle the current demand of these amplifiers. Simple physics dictates that if you want to provide output power from your amplifier you must consume input power from your car's electrical system. Therefore, 1/0 gauge power wire, and a capacitor are a must with any ZPA amplifier, keep in mind the ZPA series only accept 4 gauge directly, so a distribution block may be a necessity also. If you don't have a fused distribution block you will also need a separate fuse to protect the ZPA amplifier. This fuse is located with two feet of the ZPA amplifier and is rated at 40 amps for the ZPA 0.3 and 80 amps for the ZPA 0.5. Last modified: Tuesday October 19, 1999.